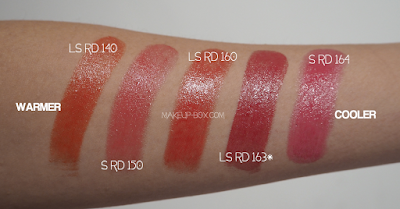 Shu Uemura recently launched a whole red lipstick collection in Lacquer, Satin and Matte textures recently, with the spotlight on a "universal red for Asian skintones", RD 163 (available in all 3 textures). 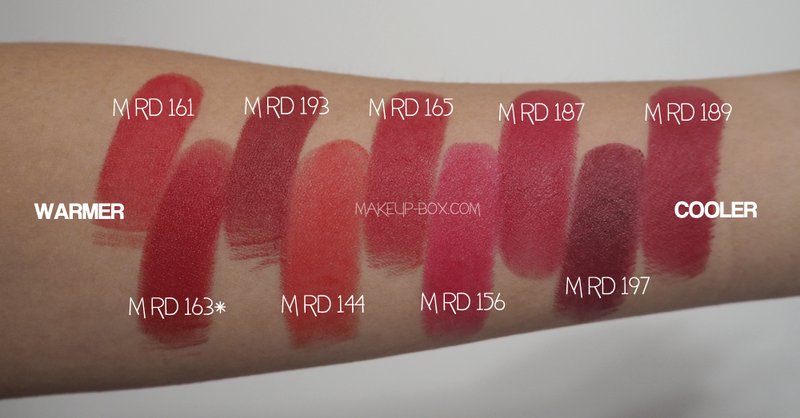 The 25 shades in the line-up include a mix of new and existing red tones, but the shades run the gamut from soft warm corals to deep dark browns, so there really isn't too much of an excuse for anyone to not find at least 1 or 2 shades that look good on them, regardless of ethnicity and skintone. I personally love RD163 in all 3 finishes. Shu touts this as a shade that contains the optimal mix of warm and cool tones to suit a majority of Asian skins. The shade itself is what I consider a warm-neutral red. Something that is close to true scarlet but leans ever so slightly on the warmer side. 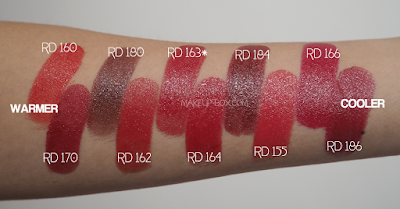 I lip-swatched 24 of the 25 shades in my Youtube video linked below (there was one shade missing in the press samples I got so I was not able to swatch all of them) and here are the arm swatches for quick comparison. This makes it quite forgiving and in fact, pretty flattering on a wide range of skin tones while staying "red" without going into rose or orange territory. A quick run-down of some of my most-loved products products in the past 2-3 months and why I'm obsessing over them! This goes from skincare to foundations to perfumes and even a hair product. If you don’t see some items I’ve mentioned before or recently, it’s either because they are long-term faves or a little too new (and have not been proven to stand the test of time yet). I narrowed it down to the things that I find myself repeatedly going back to in spite of the stream of new product launches. "Glass Skin", or an extremely dewy, non-shimmery glow, is a trend made popular by South Korean celebrities and media. But the traditional methods of achieving it - face glosses, creamy foundations etc - are not always great for real life (or warmer weather). Well there IS one forgotten product that can achieve this effect without feeling like an oil-slick or smearing off after 2 hours. MAC's classic Face and Body is an ultra glowy film-forming foundation that actually sets looking like it's wet. And because it's made for use on bodies during shoots, it's transfer resistant and sweat resistant. What better to get the glass skin effect without the cons? The thing is many people these days no longer use or even know of Face and Body, and I have to say it's got a strange texture and seems to have zero coverage at first, but there are some tricks for getting it to work beautifully. Rubbing it on with fingers ALWAYS works better than brushing it on or sponging it on. The rubbing seems to allow the pigmentation to show more, so you get more coverage. Plus - this formula just soaks into bristles and sponges and can be a pain to wash out when it sets. Also, it's fantastic for layering. I've layered up to 5 coats for more coverage and it still looks beautiful and skin-like although the sheen by then is over the top. I do like MAKE UP FOR EVER and Dior's versions but those are less dewy. So if "Glass Skin" is what you're trying to achieve, this is the only one that will give you that. HERA is one of the edgiest brands to come out of Seoul, and their Black Cushion is by far one of my favorite cushions for hot weather or oilier skins. They've launched 34 trendy Rouge Holic lipsticks at the Takashimaya counter in Singapore, and these are divided into 2 textures; cream and matte. 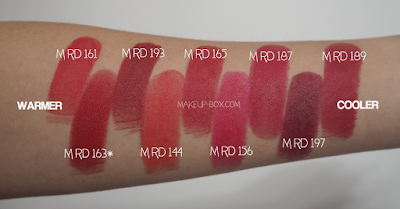 Here are 10 bestsellers, lip swatched for reference. It's a pain to swatch so many lipsticks in a row but I personally love watching lip swatch vids, so maybe someone else will find some pleasure in this LOL. 277 Lala Orange - creamy tangerine with a slight pink undertone once swatched. 112 Killing Pink - bright doll pink with a coral hue; more wearable than I was expecting. 247 Stunning Coral - stunning is right; this is more of a coral with MLBB beige/neutral tones thrown in. Extremely flattering. 297 Flame - gorgeous bright orange; total love. 327 Tempting Cherry - lovely wearable rich raspberry shade right between pink and red.